Our range of brushed tungsten wedding rings are finished with a satin brushed finish which is a very durable finish, and will not wear off as is the case with softer metals. The effect makes the tungsten ring a little duller than the polished tungsten rings which seems to be popular in the men's ranges. 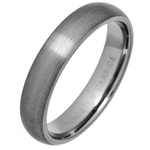 Our tungsten carbide satin brushed rings are available in men's sizes P to Z+3 and women's sizes J to S, all from stock. Our tungsten wedding rings are a popular choice for men's wedding rings due to their scratch resistant properties, and durability making them an ideal choice for men with tough jobs. Our Tungsten Carbide Rings with a Satin Brushed Finish have been rated 10 out of 10 based upon more than 42 customer reviews.